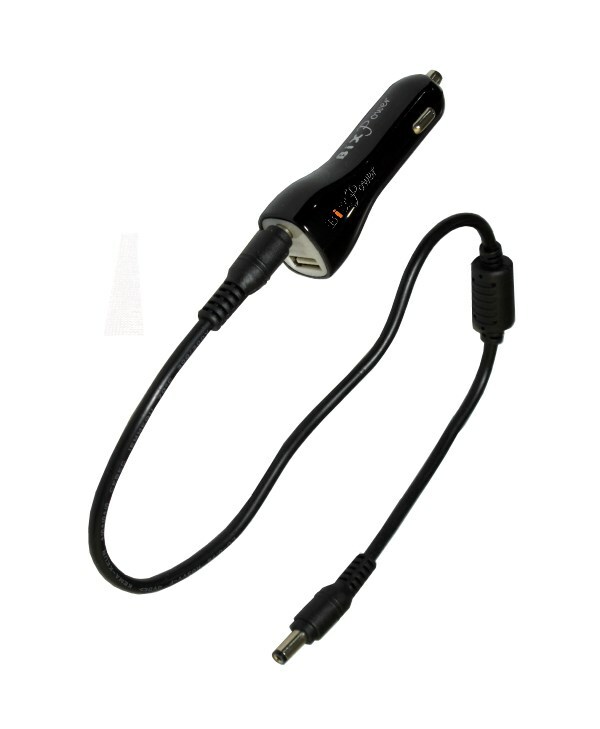 This adapter input end is a male cigarette light plug which can plug to a 12V car cigarette light socket. Its output end has two output ports: 1 output port is a 5.5 x 2.5mm barrel connector, which directly output from input without any converting. The output voltage will be same as car cigarette socket output voltage. Another output is a USB port. 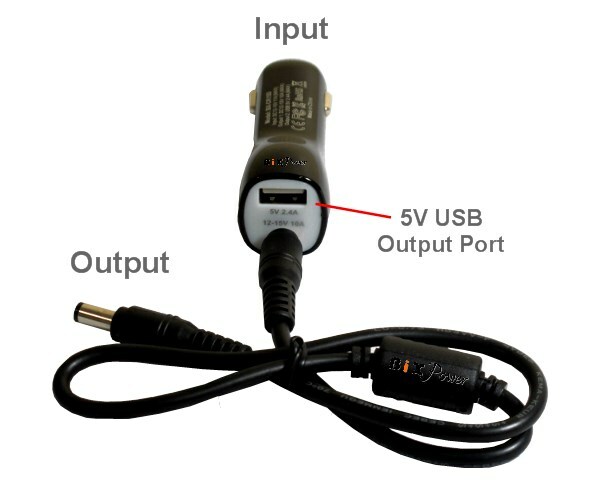 This port converts car cigarette socket 12V DC output to a 5V DC with maximum 2.4 Amps output current. 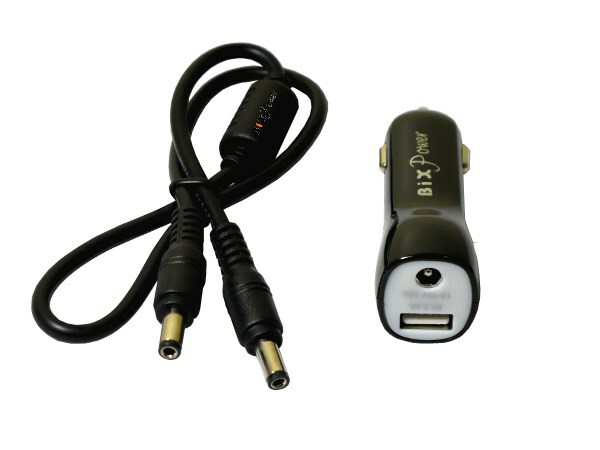 This adapter can be used in two different ways: normally, it is used to get power out from a car battery through a car cigarette socket socket. The cigarette male plug is used as input end and the 5.5x2.5mm barrel connector is used as output end. 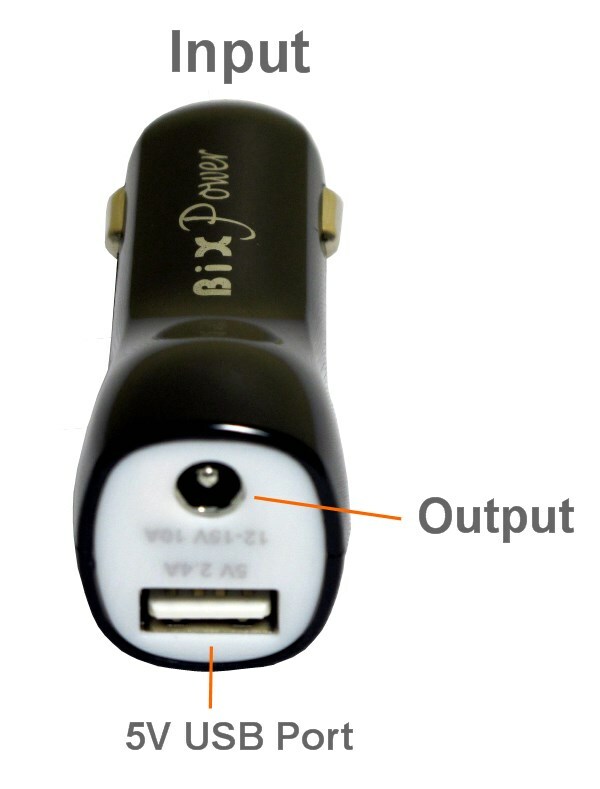 However, it may also be used in a reversed way to charge a car battery: if a car battery is totally out of power, you may charge the car battery through this adapter: just plug the cigarette male plug end to a car cigarette socket, then connect 5.5 x 2.5mm connector to a power source that can provide car battery needed charge voltage (such as BiXPower AP170 or BP220 battery with 15V output voltage setting). In this way, the cigarette male plug is output end and 5.5x2.5mm barrel connector is input end. Normally, with a 15V battery at 3 ~ 4 Amps current output after around 20 minutes, the car battery may have enough power to start the car. Please note that in some cars, the cigarette socket is disconnected from the car battery when the engine is turned off. To use this adapter, you may need to turn the car key to "On" position. Please make sure to plug the adapter to car cigarette socket first before connect it to a power source. Never let the cigarette male plug has power to it when it is not plugged. Otherwise, the male end is very easy to touch ground and cause short circuit. The package also comes with a 500mm ( or 20") long cable with 5.5x2.5mm male barrel connector on both ends. 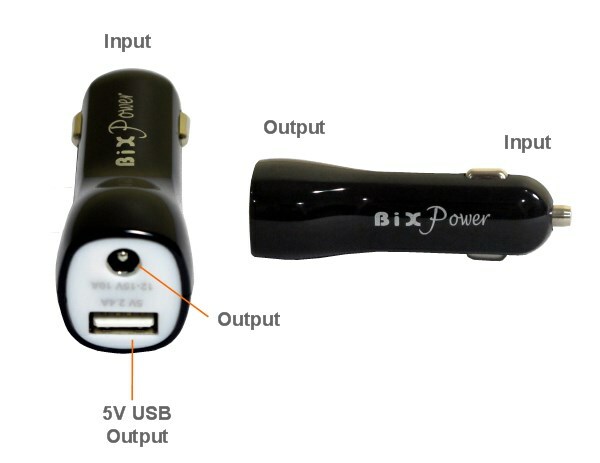 The 5.5 x 2.5mm barrel connector output voltage will be same as car cigarette socket voltage. Output I: 5.5 x 2.5mm Female Jack. Output voltage will be same as Input voltage.